Clementine Lord is not an orphan. She just feels like one sometimes. One of triplets, a quirk of nature left her the odd one out. Odette and Olivia are identical; Clementine is a singleton. Biologically speaking, she came from her own egg. Practically speaking, she never quite left it. Then Clementine's father—a pediatric neurologist who is an expert on children's brains, but clueless when it comes to his own daughters—disappears, and his choices, both past and present, force the family dynamics to change at last. As the three sisters struggle to make sense of it, their mother must emerge from the greenhouse and leave the flowers that have long been the focus of her warmth and nurturing. For Clementine, the next step means retracing the winding route that led her to this very moment: to understand her father's betrayal, the tragedy of her first lost love, her family's divisions, and her best friend Eli's sudden romantic interest. 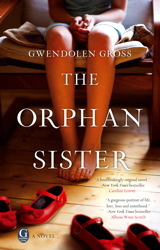 Most of all, she may finally have found the voice with which to share the inside story of being the odd sister out. . . .
Read the First Chapter Mandie's thoughts- There were things I loved and hated about this book. I can certainly say it's a great one for a book club because there really is so much to talk about. Let me start with Clementine. She drew me into the story. Her father disappears and her triplet knows what's going on. Clementine already feels left out. At times Clementine becomes whiny and I thought the name choices were odd, they were all too close together - Yes I know they are all family but it made it difficult to follow when I had to keep getting up to tend to the kids. Also all of the flipping back and forth in time, this is definitely one you have to sit down and get into. All and all I did like it, Gwendonlen Gross gets deep into this family's dysfunction and I enjoyed the relationship building with Eli.